Reality is something else, isn’t it? After playing against Colorado, Kansas City, Minnesota, San Diego and the White Sox – all of whom sport an under .500 record – the Rangers had the immense pleasure of facing the defending World Series champion Houston Astros. For however it counts, Texas put up a nice fight in the brief two-game series, even though they lost both contests. In my own opinion, that’s important for a ball club destined for a losing season. If you’re a fan of the White Sox or Baltimore Orioles, baseball can be entirely unwatchable for longer stretches than you’d care to admit. For the Rangers, sure there have been a couple of games like that, but every team has that. Texas, instead, needs to be attracting and retaining fans this year based on hope. 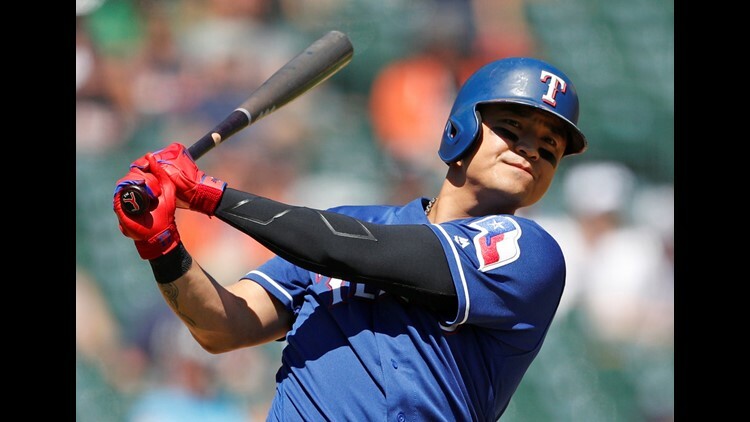 With stories like the leadership of Shin-Soo Choo and Robinson Chirinos and the emergence of Isiah Kiner-Falefa and Ronald Guzman, Ranger fans might not have much past the month of October in both 2018 and 2019, but they can at least see that the club is going to be in good hands. Perhaps more concerning is whether one particular player might foil the “rebuilding” of the farm system with how he’s performed. It’s official now – Shin-Soo Choo has set the franchise record for consecutive games on-base with 47. There were some dramatics in the last game on Sunday, as it took a bloop hit from Ronald Guzman and Carlos Tocci keeping the bat on his shoulder for three called strikes for Choo to get a fifth at-bat, but he came through with an infield dribbler down the 3rd base line. Choo has now worked himself into a .293/.399/.504 slash for the year and did enough to earn his first All-Star Game bid. If you ask anyone in the Rangers’ clubhouse, they are sure to tell you that there should have been little doubt as to whether he would be representing the Rangers in Washington on July 17. Also lost in the shuffle last week was the great job Robinson Chirinos did at the plate. Before running into the Astros, Chirinos had a nice little six-game hitting streak going, during which he hit .429/.500/1.000 with three homers and 12 RBI. He definitely cooled off since, but I feel bad for not mentioning him last week. The Rangers’ best offensive day was on Thursday against Detroit, scoring seven runs in four innings off of Tigers’ starter Matt Boyd. They ran into great pitching performances from Jordan Zimmermann and Mike Fiers, Detroit’s two best hurlers this season. As mentioned, the offense put up an admirable performance against the Astros, which is a feat, and were able to back a great performance from Austin Bibens-Dirkx in the series finale. Let’s say you know you’re a supposed premier starting pitcher and you know you’re being traded. One bad start against a bad team is an aberration. Two in a row is troubling. Three in a row, over which you only pitch 10 2/3 innings, give up 14 runs for an ERA of 11.81 and opponents are hitting .418 off of you, could start unpacking your suitcase. If Cole Hamels has another awful outing against the worst team in the American League, the Baltimore Orioles, is it entirely possible that nobody wants him? As I said last week, how well you beat up on non-contending teams can be the decisive margin by which you either become Division Champ or Wild Card team. Down the stretch, the number of non-contending teams increases. A pitcher with the reputation of Cole Hamels should be running through the Padres, White Sox and Tigers like a hot knife through butter. Is it possible that Hamels just needs to put all of this trade talk behind him and just get traded to end it? Sure, but, publicly, nobody’s accusing 13-year veteran Cole Hamels of being distracted by trade talks, especially when he’s been through it already. At a time when he should be showcasing his best stuff, Hamels is showing teams that they should look elsewhere if they want to upgrade their rotation. Maybe asking if any team will want him at all is a little dramatic, but with each poor start, Hamels decreases the currency that teams are going to be willing to pay for his services. Whether that means the Rangers have to eat more salary for this year and next year or have to accept a lesser-quality prospect package remains to be seen. Something to watch for will be to see if Bartolo Colon, a rental pitcher who would be owed fewer than a million bucks for the rest of the year, would fetch a better return for Texas than Hamels. That’s a “Hot Take,” without a doubt, but Colon is by far out-pitching Hamels right now and wouldn't require the pick up of a $20 million option for next year to acquire. I’m not saying Colon would go to a definitive contender (Cleveland, Boston, New York), but it only takes a fringe team with a lot of chutzpah and the belief that they could push into the Wild Card game (Washington, St. Louis, San Francisco) or overtake a 1st place team (Chicago, Philadelphia or Atlanta) to make an “All-In” move. The Rangers’ bullpen still holds strong, especially Keone Kela. Kela, continuing to bring down his ERA, is 22 for 22 in save opportunities, sports a 1.35 ERA over his last seven appearances, nearly an 11 K/9 and just over a 3.5 K/BB rate for the year. You think someone like Washington, Cleveland or even one of the “surprise” teams like Atlanta or Philly could use someone like that finishing their games? Even though the Rangers could talk themselves into keeping Kela for the next few seasons, leading into Globe Life Field, Kela’s value to other teams is no larger than it is right now. The bullpen underwent a pretty drastic facelift just before Sunday’s finale against the Tigers. Matt Bush and Tony Barnette, who had been on the 10-Day DL, were transferred to the 60-Day DL, clearing up a couple of 40-man spots for a couple of imports from the San Francisco Giants. Jon Daniels acquired right-handed pitcher Cory Gearrin and outfielder Austin Jackson to take those spots. Gearrin will join the bullpen in Boston on Monday. Jackson…may or may not join the club. Jon Daniels may try to flip him. More central to the acquisition was right-handed starting pitching prospect Jason Bahr. Bahr will go be a Wood Duck in Class A Advanced ball. After singing Delino DeShields’ praises for so long this season, he was undoubtedly due to make a huge error. He did so during Cole Hamels’ disastrous start, misjudging a fly ball that would have ended the inning after just three runs. Instead, DeShields didn't go back far enough and the ball ticked off his glove and resulted in a three-run, two-base error. Let’s not take away from the fact that Hamels pitched terribly, but DeShields’ miscue in center didn't help the cause. Let’s talk on the positive side and mention Isiah Kiner-Falefa behind the plate. IKF, who, by the way, is third on the Rangers in cumulative WAR with 1.7, has now caught Austin Bibens-Dirkx twice and both times have resulted in his hyphenated teammate turning in a stellar performance. He’s been able to provide a great option as a backup catcher without a major dip in production at the plate. We’ve said it before, but Isiah Kiner-Falefa’s emergence as the Rangers’ Swiss Army Knife has been a revelation. Texas has a tough three game set at Fenway Park against the Red Sox before finishing off the first half of the season against the floundering Baltimore Orioles. This could be the last chance for Rangers’ players most likely on the trading block to show what they can do, as Texas hits a VERY rough stretch of tough teams after the break. Do you think Bartolo Colon has more trade value than Cole Hamels? Share your thoughts on Matt's hot take with him on Twitter @FisherWritesMLB.